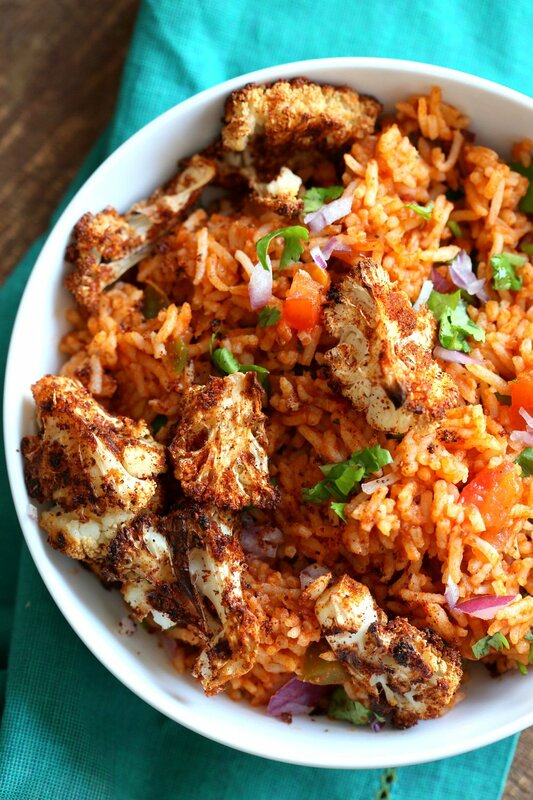 Easy Vegan Spanish Rice Bowl with Taco Spice Roasted Cauliflower. Everyday Meal with everyday ingredients. Make into burrito or wraps. Vegan Glutenfree Nutfree Soyfree Recipe. 30 Mins, Easily made Oilfree. When you have limited things in the fridge but want a fantastic flavorful meal, this Spanish Rice Bowl checks all the points. It uses everyday ingredients, is quick, flexible and has so much flavor! Make the simple Spanish rice, Roast up the veggies, load a bowl with toppings of choice such as salsa and avocado and done. Add beans for a hearty meal. I generally use my own Taco blend so that I can adjust the flavor to preference. Use any taco seasoning or chili blend of choice. Although the title being used is Spanish rice, it is basically mexican rice. Spanish rice (from spanish cuisine is slightly different with saffron and other ingredients). 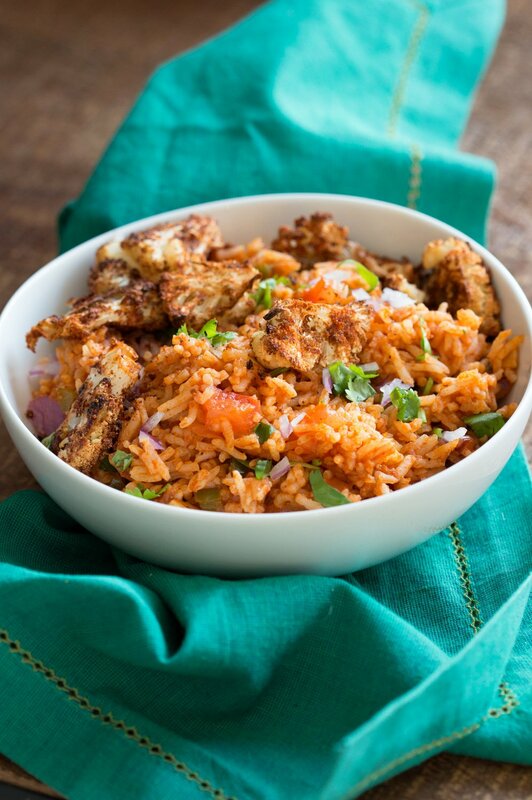 Mexican rice is also called spanish rice at times. Mexican rice also has many variations and recipes. This is my interpretation of the tomato based rice dish and I ended up choosing Spanish rice as that is a more popular search term. 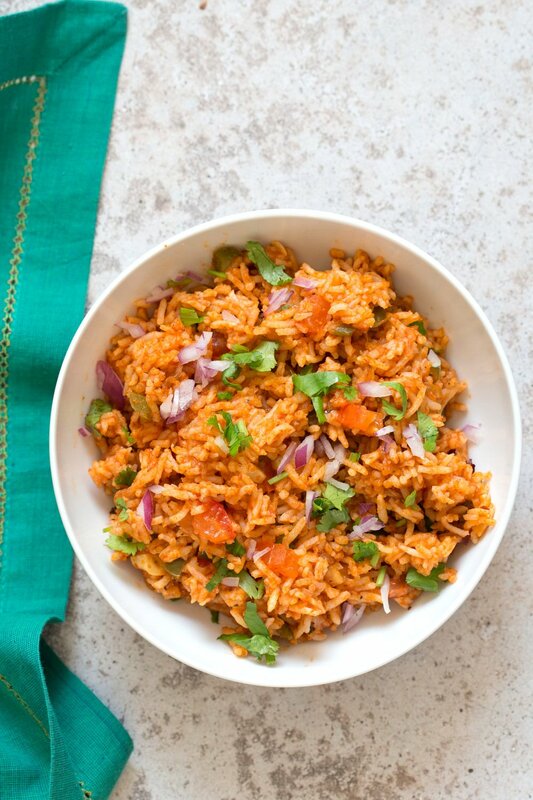 More Easy Bowls from the blog..
Spanish Rice: Blend the tomato, onion, cumin, chili powder, jalapeno, garlic powder until smooth and set aside. Drain the rice and combine with 1 3/4 cup water in a saucepan. (You can roast the drained rice in 1 tsp oil for a few mins until it starts to turn golden before adding water). Add the pureed tomato mixture, 1/2 tsp salt and mix in. (at this point you can also add some chopped bell pepper). Cover and cook over medium-low heat for 16 to 18 minutes or until the rice is cooked through. Mix in about 1/4 cup chunky salsa and the chopped cilantro and fluff. Taste and adjust salt, flavor(add more chili powder or taco seasoning, more salsa if needed). Roasted Cauliflower: Drizzle oil over the cauliflower florets. Mix in well (I use my hands to rub the oil all over). You can also add other veggies to the mix such as broccoli, zucchini, sweet potato, rutabaga. Increase the spices and salt accordingly. Mix the spices and salt in a small bowl then sprinkle all over. Toss to coat. Distribute the Cauliflower on a parchment lined baking sheet or baking dish. Bake at 425 degrees F (220 deg C) for 25 mins or until the veggies are cooked through. 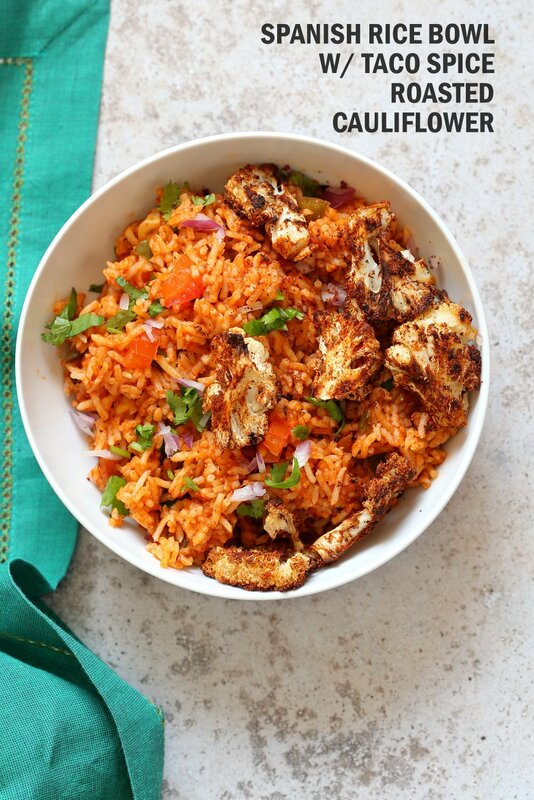 Serve the spanish rice with the roasted cauliflower/veggies, sprinkle of lime juice, some salsa and guacamole/avocado. For a hearty meal, add beans of choice. I also like a dash of black pepper over the bowl. The mix can also be made into burritos with some lettuce and refried beans. Add some refried beans or walnut taco meat to the bowl for variation. Taco Seasoning: Mix and store. 1/2 tsp cayenne (optional, add less to pref), a good pinch of all spice or cinnamon. Brown Rice: Use 2.5 cups water for brown rice, add a bit more of the spices and herbs. Bring to boil over medium heat, then reduce to medium-low, cover and cook for 45 mins or until the rice is cooked through. Let the rice sit covered for another 5 mins, before fluffing and adding salsa. Oh my goodness this looks absolutely delicious! I confess I’m a “buy the little box of “Spanish Rice” processed food junkie. I try for the most part to do a WFPB diet, but haven’t tried to make Spanish Rice on my own. Cannot wait to make this! Thanks! its super easy and flexible. use whichever ingredients you have. 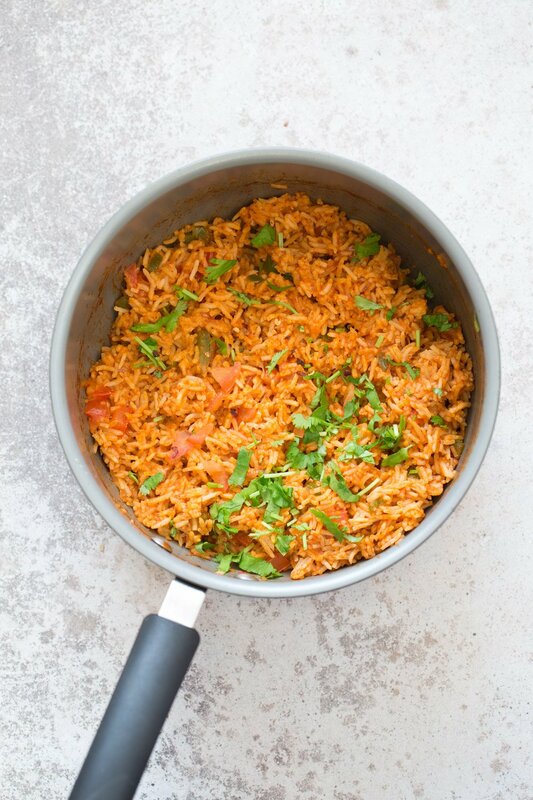 I grew up eating a version of Spanish Rice and had kind of forgotten about it. This is a great reminder and a much healthier version. Thanks! This looks amazing! Could I make the rice in my Instant Pot instead? Sure. i havent tried it. Rice is a bit tricky to make in the instant pot, over cooking or burn issues coz of the less liquid etc. But if you have nailed down the time for the type of rice you usually make, then use it. Use a bit less liquid that listed. Yum, I had paella last night! So yummy, but this looks even better! I love the roasted cauliflower. It looks so perfectly crisp and flavorful! This looks so nice, even though am not a fan of rice. But looking of this I want to eat the whole thing. The pictures are so good and the recipe is very easy to understand. Can’t wait to look all the tasty recipes on the blog. Keep up the good work. I really liked the flavor of this rice but I seem to be missing the boat when it comes to cooking times. I cooked the rice at medium low for 16 minutes and it was still quite firm with much water left over. When I tried to bring the rice to a boil and then cook at medium low for 16 minute the rice was overdone and mushy. Do you have any suggestions? Looks great! How do you think this would be with brown rice? So delicious! I will use this recipe to make Spanish Rice from now on. I used roasted cauliflower and carrots with the rice. It is so good and I will make again soon. Thanks for the recipe! Spanish and mexican are two completely different things. Spanish from Spain, Mexican from Mexico. Hello! Wonder if Rice part can be made in the Instant Pot?